The client’s vision was to create a modernist dwelling as their own family home, alongside their existing 1930s house, on what was a large suburban plot. The planning challenges were considerable as there was a presumption against backland development, the architectural style was very different to the surrounding properties, and there were issues with regard to access and neighbour privacy. 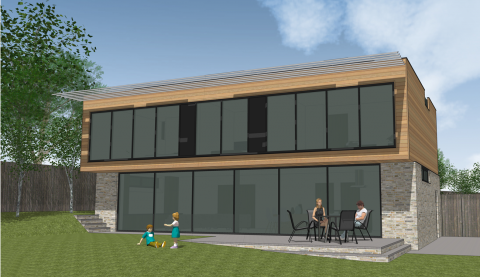 We engaged very early with the local planning authority and developed a design which met the client’s aspirations, whilst simultaneously addressing the issues of overlooking as an integral part of the design. We used 3D modelling to demonstrate that the next door neighbour’s property could not be overlooked from within the new house. We were also able to work with the client’s own desire to create a sustainable home by including a range of passive measures including stabilising internal temperatures through use of thermal mass, a sustainable urban drainage system (SuDS), and photovoltaic (PV) panels. Notwithstanding the wide ranging challenges, planning permission was granted without the need to go to committee.